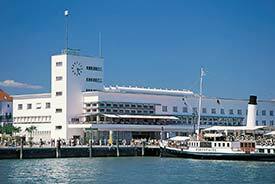 ABOVE: The Zeppelin Museum is on Friedrichhafen's waterfront promenade, facing the harbor on Lake Constance (a.k.a. the Bodensee). INSET BELOW: A 1908 Zeppelin, and a replica of the Hindenburg's interior. Today, most people regard Zeppelins as a short-lived phenomenon that ended with the explosion of the Hindenburg in Lakehurst, New Jersey in 1937. In reality, the rigid aluminum-framed airships were in service for nearly 40 years, with their development culminating in the sister ships Hindenburg and Graf Zeppelin II, which carried up to 50 passengers and a crew of 40 in transatlantic service between Germany and the United States. The first Zeppelin, the LZ1, had its maiden flight over the Bodensee (Lake Constance) in 1900--some three and a half years before the Wright Brothers flew their way into history in North Carolina. Scores of Zeppelin airships were subsequently built by Count Ferdinand von Zeppelin's company, which was based in Friedrichshafen, Germany on the lake's northern shore. The Zeppelin era came to an end in 1940, when the German government had the airships broken up for scrap metal. Today, the Zeppelin's technology and history are on display at the Zeppelin Museum Friedrichshafen, which occupies the city's restored Hafenbahnhof (Harbor Railway Station) from the 1930s. The museum's exhibition space (43,000 square feet or 3,995 m²) offers historic photos, objects, artworks, a movie theatre with a Zeppelin documentary, and--most important--a partial life-size replica of the Hindenburg. This simulated airship has a cutaway hull section, passenger cabins, and public rooms that suggest what it was like to enjoy a three-day transatlantic crossing at a cost of 1,000 Reichsmark (about €30,000 in today's currency). Photos copyright © Stadt Friedrichshafen.